I've spotted Lush's Toothy tabs both in store and online but they're not something that I've personally considered trying in the past. The Toothy tabs used to come in a little cardboard box, similar to a little matchbox, but they've recently had a makeover and now come in little plastic bottles. They've also introduced Tooth powder, which I believe is a brand new product. 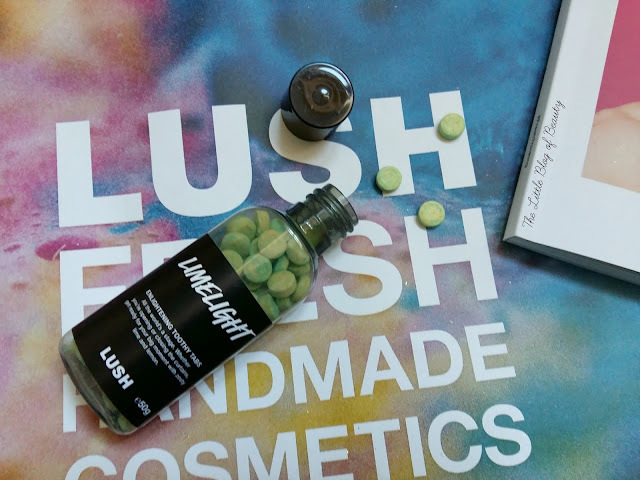 When I attended the Lush Meadowhall store re-opening party I found a bottle of Limelight Toothy tabs* in my goody bag. If you're a traditional mint fan when it comes to toothpaste then you may want to go for Dirty or Miles of smiles as these contain mint, but if you fancy going for something different then there's five others to choose from. 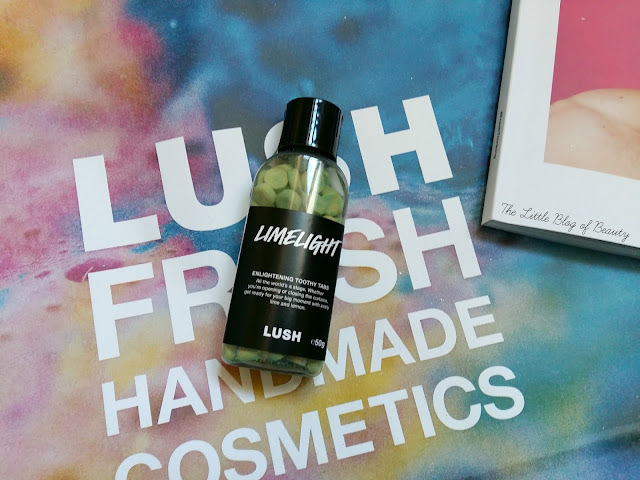 I'm not entirely sure what each of the others taste like as they have various different flavours in them but Limelight contains lemon and lime so you get a citrus sherbet type flavour. Unless you've tried unusual flavoured toothpastes before they can feel a little strange at first. The idea with Toothy tabs is you pop one in your mouth, chew it up and then brush your teeth with it. Just don't forget that it's not a sweet and end up swallowing it! There's no warnings on the packaging to say that you shouldn't swallow it, so I doubt it would do you any harm, but you will have wasted a tab and will have to chew up another one. I don't have a powder to try but I guessing the way these work is that you wet your toothbrush and dip it into the powder so it sticks. I would imagine any other way of trying to use it would get very messy. As I said these do take a little getting used to but once you've nibbled it down into a paste it's just like a thin toothpaste. You won't get mountains of froth like most traditional toothpastes but there's definitely enough there to give your teeth a good clean and when I've finished it doesn't feel any different to when I clean my teeth normally, apart from that there's no minty feeling. One thing I would say about the ones I have (I don't know about the others) is that they do contain lustre. I know Lush apparently like to pop some glitter/shimmer/lustre in most products now but come on, this is toothpaste! I have no idea if you can recycle standard toothpaste tubs but as with the majority of Lush packaging the Toothy tab bottles are recyclable but you could also make use of the packaging for something like storing hair grips or any small objects. I would say these are probably great for travelling as unlike traditional toothpaste tubes there's no chance of this getting squished and covering everything else in toothpaste. They also have a long date on them (mine have 14 months) so you can save them for holidays/weekends away. I'm not sure exactly how many are in there but there's definitely enough for at least two fortnight holidays if you brush twice a day. I'm not sure that I'll be switching over to using these instead of traditional toothpaste, but it's a nice product, especially if you like your products a little different. The Toothy tabs are £4.95/£5.95 each and are available from Lush stores and online. Have you tried Toothy tabs? I've read some good reviews about these and would like to try them - I often brush my teeth in the shower (points for multitasking!) and feel like that would work well with these! !